This is a writer’s blog, but after we learned about a job loss in our household, I started researching some things. In the process of this, I learned something I feel compelled to share. Maybe everyone already knows this and what it means, but if there’s anyone out there that this enlightens or convinces them to call their representatives, then it was worth posting. In the United States, Social Security is used to pay out benefits once you retire. I’ve been paying into the system for almost 25 years with the government constantly telling me that there would be little-to-no money left for me by the time I retire. I’ve grumbled about it, but as Social Security is the only way my grandmother survives, I rationalized it to myself that I was paying for her benefits. Then, I learned something that not only surprised me, but made me angry. Americans only pay social security tax on the first $118,500 they make in a year. Don’t believe me, here are the facts from the US Government, and they don’t joke about paying your taxes. So what, you say? Doesn’t really matter. Most people don’t make that much money. Except for the few that do, it matters to all of us. Let’s walk through it to show you what I mean. The median family income in 2015 was $55,775. Those people paid ~ $3,500 in social security taxes or 6.2% of their income. That means 100 middle class families paid in $350,000 or 6.2% of their income. The 100 highest paid CEOs made $3,039,053,167 (and no, I didn’t accidentally add an extra 3 digits). These 100 CEOs paid in $737,700 to social security or 0.02%. If those 100 CEOs would have paid tax at the same rate as the median American family, they would have contributed $188,421,296. You know, over $187 million dollars more in one year. And that’s just looking at the top 100 CEOs. Interestingly, within minutes, I received an e-mail reply with a standard form letter. Not at all what I wanted. Ah, more research!! Turns out, almost all members of the House and Senate don’t even bother to look at e-mails. They have a script that picks out key words and sends a standard e-mail in return. So, I did more research on how to get them to listen to me. Don’t bother writing a letter, posting on Facebook, or any other social media. Best way to get their attention is for you and as many people as you can possible find with the same concerns as you show up at one of their town halls. Yeah. This is the only way you will ever talk to your representative instead of one of his staffers. The only way. Second best way is to pick up a phone and call. The research I’ve done says to call their state office rather than their office in Washington DC. A phone call requires them to talk to you. If you can get a lot of people to call about the same issue, you can bet the staffers answering the phones all day are going to be telling their boss. So, even if you don’t care about social security, hopefully this will help you with an issue you do care about. I’ve had a contract with the US Government since I was sixteen. You collected Social Security taxes from my check, and when I was 65, I would retire and collect benefits. But there isn’t enough money, so you pushed back my retirement age. There still isn’t enough money, and now I’m told to plan for a significant reduction in my benefits without any reduction in my taxes. I accepted it. 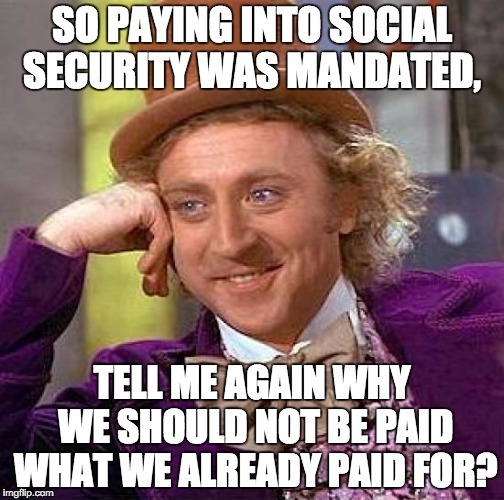 Social Security is the only way my grandmother survives, so I rationalized it as paying for her benefits. o Those people paid ~ $3,500 in social security taxes or 6.2% of their income. o That means 100 middle class families paid in $350,000 or 6.2% of their income. o These 100 CEOs paid in $737,700 to social security or 0.02% of their income. If those 100 CEOs would have paid tax at the same rate as the median American family, they would have contributed $188 million dollars to social security. That’s $187 million dollars more than what they did pay in a single year. And that’s just looking at the top 100 CEOs. I thought you might already be trying to fix this, but I couldn’t find any bills currently under consideration to make the Social Security tax applicable to everyone. What I need you to explain to me is why there isn’t a bill out there to fix this. Why you expect my family to pay 6.2% of our income for benefits we’ll never receive, but not all Americans are paying this. Especially as the numbers are telling me that if we taxed everyone equally, you could live up to the agreement you made to me when I was sixteen. The real answers aren’t pleasant or easy to hear, but my solution is to end the program and let the American people plan for their own retirements. True. And maybe that is the answer. Or a named scheme like they have in Canada. The purpose of the program was to reduce poverty among the elderly, which it has done, dropping it from 35% to less than 10%. I don’t have the answers, but I still think everyone should be taxed equally. A flat tax DOES tax everyone at the same percent. More money, means you pay more cash out but the percent is the same. A real issue is the government waste that accompanies everything they do. But to be honest, while I don’t mind helping people trying to help themselves our system of government aide is rife with fraud and abuse. We have a perverse incentive not to work when you make more on welfare than you can earn at a job. The more the government tinkers with the system, devalues our dollar and does short term things to solve long term problems, the worse it gets and will continue to get.